Winterlude's overnight passage from the Culebra Cayes to San Pedro, Belize was ALMOST perfect! Winds were 10-15 from the NE enabling us to sail south, the seas after the first few hours calmed to almost flat & we both got 6 hours of sleep! Unheard of! Unfortunately at 7 AM Wednesday morning, cruising threw another challenge at us! First, the scenario-we're sailing toward San Pedro Pass which has a fearsome reputation as one of the smallest, most difficult reef entrances in Belize. Warnings in the cruising guide specify "DO NOT ENTER" in pretty much anything other than perfect wind & sea conditions. The cruising guide also says that SOMETIMES there's a yellow buoy in the middle of the pass ... and sometimes not. David & I were both nervous about this reef entry since we had no idea if the buoy would be there or not & there are no other real landmarks to find the right break in the reef, there are three breaks in front of San Pedro and the other two you can't get through. We did have a few waypoints from another boat, but we don't entirely trust this guy, he's more than a little eccentric! the diesel outside a reef is my biggest fear. to the engine. Just the day before, David had done some basic maintenance on the diesel-tightening up the alternator belt which was very loose, adding transmission fluid, tightening some bolts to try & stop the transmission fluid leaks, etc. Anytime we make changes to something that subsequently doesn't work, we assume operator error. What did we mess up this time? 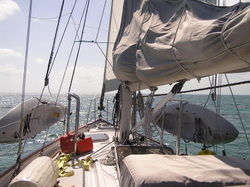 At this point, we checked in with the Northwest Caribbean Net to see what our options might be-basically we can't get in San Pedro Pass, but we could keep going 20 miles or more south to the English Channel & sail in close to Belize City. Then the Cucumber Beach Marina would be standing by and could send a launch out to tow us in to the marina. Unfortunately with the light winds, we were only making 1.7 knots and it would take us at least another 24 hours to reach the channel. Then we'd have to SAIL in a busy ship channel. Very scary, but it might be our only option if we couldn't get this fixed! We decided to put up the cruising spinnaker to see if we could gain boatspeed. No luck - no wind. David doublechecked the alternator, the strainer, the pressure gauge that shows if a fuel filter needs replacing ... OOPS! The gauge is showing a blackline-that's strange, it was fine the day before & we'd run the fuel polishing system to insure no gunk in the fuel. But there was no mistaking the blackline on the gauge. David changed the racor & the other fuel filter (good thing we'd taken the time to track down those fuel filters in Isla a couple weeks earlier because without them, we'd have been out of luck!!!). Still sputtering & coughing, but it didn't die. We shut it down again & David cleaned out the fuel intake lines & VOILA! Back in business. After the fact, we realized that we probably let the fuel run too low in the first tank-with all the sloshing around even in almost flat seas, we probably stirred up anything left over in the bottom of the tank. Next time, we'll switch to the other tank before letting the fuel get so low. The fuel polishing system does a good job, but there's always gunk in the bottom of an old fuel tank, no matter how many times you have the tanks cleaned. asked for Winterlude-we don't know ANYONE down here. Turned out to be Jerry & Lynn on s/v Eriu - they had a SSB receiver, but no broadcast capability & heard our conversations on the NW Caribbean Net about no diesel earlier in the day. They were checking to see if we got the diesel running & were able to give us exact entry instructions! What a great community cruisers make!!! We made it, no problem & anchored in 7' of crystal clear water between two starfish-we thought Mexican waters were clear, but Belize has them beat hands down! 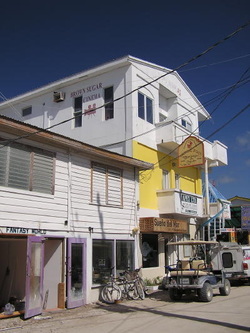 We checked in to Belize-easy, no hassle and most amazing, NO CHARGES! Took 10 minutes total. Flip Flops and Sand Streets! the reef all day! We did some reconnoitering in the dinghy and located a sand patch with enough depth for Winterlude and reanchored. Then we went to explore San Pedro-other boats told us that San Pedro is way too commercial for their tastes, but to us it seems like a great little Caribbean village.